As Edgar Wright's new film, Baby Driver, speeds into cinemas in June, the EIFF are celebrating the comedy director with EIFF: Play, a new strand where you'll be able to tackle retro games after watching Scott Pilgrim, play zombies post-Shaun of the Dead, and see Hot Fuzz at a village fete. Here, three of our writers explain their favourites. Of all Edgar Wright's films, Scott Pilgrim vs. the World – the 2010 adaptation of Canadian cartoonist Bryan Lee O'Malley's bright, poppy, Manga-esque series – is the most underrated. Alongside a stunning before-they-were-famous cast (Anna Kendrick, Brie Larson, Aubrey Plaza, Chris Evans), it starred Michael Cera as the duffel-coated, bass guitar-playing millennial of the title, whose quest is to fight his way through his dream girlfriend's evil exes as though he were battling his way through an arcade beat-'em-up. A box office bomb (Variety called it 'attention-deficit filmmaking at both its finest and most frustrating'), the film's heavily-stylised production – all sound effect text and frantic jump cuts – rubs many viewers up the wrong way as much as the couldn't-care-less pose and over-crafted, comic book dialogue of the characters. Yet this was a hundred percent the point, and it's easier to see now that Wright crafted a film that was ahead of its time; a living personification of comic and gamer style for both male and female fans, in which characters invent their own gaming avatars or cosplay personas and live them out IRL. It also set the tone for mainstream cinema in the 2010s, predicting the tone of the Marvel Cinematic Universe. See Scott Pilgrim at Potterow on Thu 15 Jun, with a retro game-filled after-party at Teviot Row House. Horror comedies are tough to pull off. It's difficult balancing laughs and terror effectively. And while Shaun of the Dead is packed with quotable lines, visual gags and killer comic timing crucially it never forgets to take its monsters seriously. There was an obvious love of the zombie movies that inspired it, particularly the films of George A Romero, who practically invented modern undead lore with 1968's Night of the Living Dead. The zombies are ugly, dangerous and deadly, but the stroke of genius was repositioning the action in faceless London suburbia populated by a bunch of slackers (ie Simon Pegg as the eponymous Shaun and Nick Frost as his mate Ed). Shaun's attempts to rescue the love of his life, Liz (Kate Ashfield), becomes even more heroic in its shambolic ineptitude. And the love was reciprocated with Pegg and Wright popping up with a quick cameo as 'photo booth zombies' in Romero's return to the genre with 2005's Land of the Dead. It also marks the first post-Spaced project from the triumvirate of director Edgar Wright and actors Pegg and Frost, the first entry in what would become their beloved Cornetto trilogy, a skewed take on the trio's favourite genres: horror (Shaun), action (Hot Fuzz) and sci-fi (The World's End). Add guest spots from some of the UK's finest comic actors (including Dylan Moran, Jessica Hynes, Bill Nighy and Peter Serafinowicz) and you have a near perfect recipe for cult comedy heaven with a side order of brainsssss. 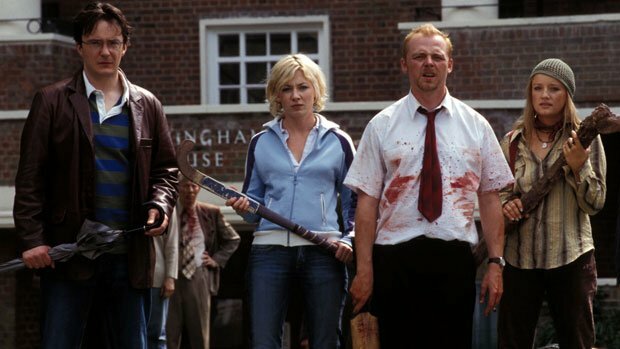 Head to the Biscuit Factory on Thu 22 Jun for Shaun of the Dead and a zombie after-party. Hot Fuzz is the second – and the best – of Edgar Wright's Cornetto Trilogy. Exceptional London police officer Nicholas Angel (Simon Pegg) is transferred to twee Sandyford, where he and his new partner Danny Butterman (Nick Frost) uncover the shocking truth about the Village of the Year in a no holds barred action fest that definitely incurs a lot of paperwork. From lead roles down to cameos, it's a who's who of British comedy; Martin Freeman, Steve Coogan and Bill Nighy star as a trio of senior Met police officers; Stephen Merchant loses a swan; Olivia Coleman is a dirty-minded PC; and the wonderful Bill Bailey plays twin desk sergeants. There's a tight script with a proper mystery to solve and adversaries to overcome yet it's full of comedy gold, accompanied by Wright's playful rapidly-edited montages. Plus, it's laden with film references: The Shining, Lethal Weapon, Mad Max, Goodfellas, Reservoir Dogs – even Jurassic Park. Each time you watch it, you'll spot another. Hot Fuzz allows Pegg to step into a different role: while Tim of Spaced and Shaun from Shaun of the Dead are both loveable man-childs, here he's tasked with portraying a dedicated stickler-for-the-rules. It gives him and Frost a totally different dynamic: rather than starting off as friends, they become buddies throughout the film, learning from each other in a genuinely heart-warming way. With no token romantic interest to distract from their bromance, it's the ultimate buddy cop comedy. Bring the noise. See Hot Fuzz at EIFF's very own summer fete, at Church Hill Theatre, Thu 29 Jun.